Your special dog(s) will receive our signature gifts during the most popular Holidays of the year. Starts on the closest Holiday from your ordering date. Includes Choice of Brownie or Cookie Cake with three of our Dog Favor Bags(contain 4 oz. 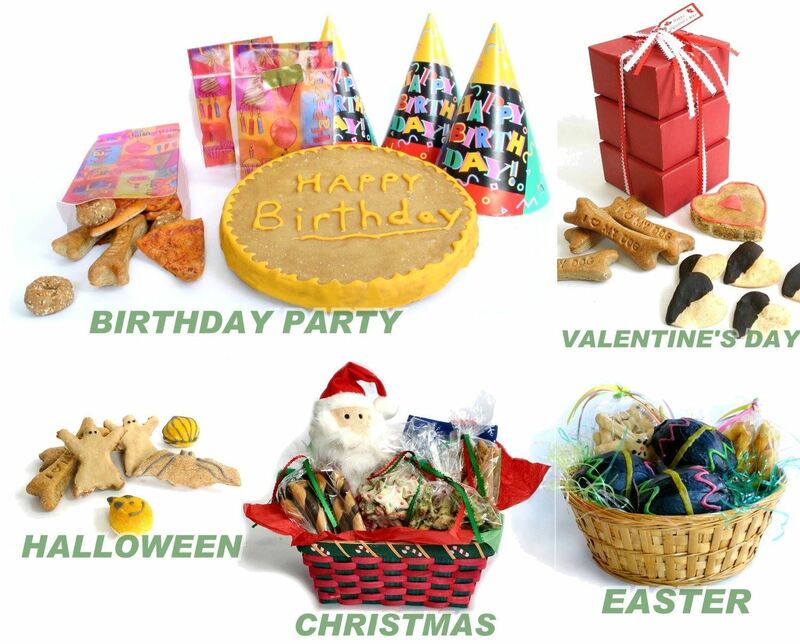 of our Pizza Slices, Apple Oatmeal Bagels, and Chicken Bones) , 3 Party Hats, and Napkins. 3 Boxes containing 1/4 pound each of Our Peanut Butter and Carob Hearts, 4 Heart Shaped Carrot Cake, and Chicken Bones Stacked High and wrapped in decorative Valentine ribbon. An Easter Basket containing 5oz. of our Carrot Twists, 4 oz. of Peanut Butter Bunnies, And 3 large Brownie Easter Eggs made with carob of course. Ghosts, Beefy Bats, Very Veggie Pumpkins, and Chicken Bones. A festive basket filled with one pound of our Christmas treats; Peanut Butter and Carob Candy Canes, Breath Freshening Christmas Trees, Apple Oatmeal Stars, and Chicken Bones. It also includes a plush dog toy and a dog bandana. *A one time $8.50 shipping and handling charge will be charged when you place the order.